A kitchen remodel can be expensive, and homeowners are justifiably careful about staying within budget. However, there are certain areas in every kitchen where a splurge may be worth the price in terms of efficiency, looks, and durability. 1. Commercial-Grade Range Hood – Investing in a commercial-style range hood means never having to deal with cooking odors—and keeping a busy kitchen cooler. 2. High-Quality Hardware – Look for quality cabinet knobs, hinges and pulls in brushed nickel, bronze or stainless steel. They add class to any kitchen and will last longer than those made of plastic or wood. For the ultimate in opulence, spring for hand-blown glass. 3. Soft-Close Doors and Drawers – You can’t slam these quiet drawers or doors, which makes for a more serene kitchen. They are also great for young families because they close slowly, so little hands and fingers won’t get caught or pinched in them. 5. Stainless Steel Appliances – These are worth the added expense because they are stylish, sophisticated and efficient. The newest models offer greater versatility than more traditional models. 6. Warming Drawer – Look for an oven that comes with a warming drawer, or have one custom-built into your kitchen. They are ideal for entertaining, keeping food at just the right temperature for late guests. Lastly—and most importantly—invest in a professional. 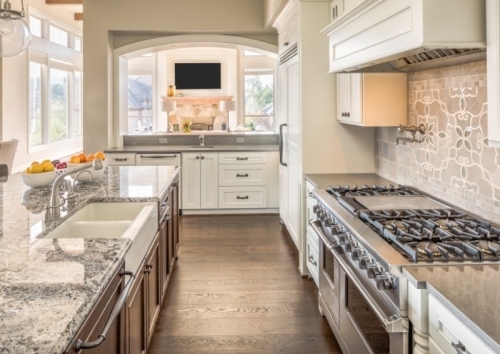 An experienced kitchen designer can help ensure you get the kitchen of your dreams without the guesswork or stress.